Finally, I'm blogging about Mayberry. 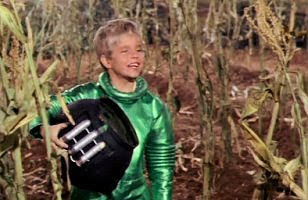 Sometimes when I get to a certain blog, I am baffled that it took so long to get there, but then, in my attempt to balance the types of shows and films I cover, and the rate in which I post, I suppose I shouldn't be too hard on myself for taking this long to get to this classic television franchise. Spring 1878--RAWHIDE KID: SLAP LEATHER--This crossover involves Laura Ingalls (LITTLE HOUSE ON THE PRAIRIE), the town of LONESOME DOVE, KID COLT, THE LONE RANGER, THE TWO-GUN KID, Kid Shaleen (CAT BALLOU), Bernard Phife the First (ancestor of Deputy Barney Phife of Mayberry), the Cartwrights (BONANZA), newspaperman Lew Grant (ancestor of LOU GRANT), and Will Kane (HIGH NOON). 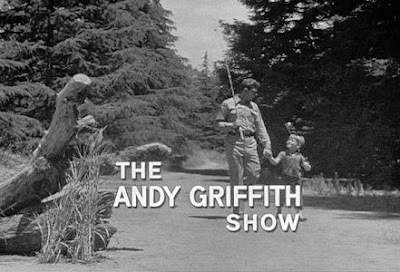 1960 to 1986--THE ANDY GRIFFITH SHOW--The story of Sheriff Andy Taylor, his son Opie, his Aunt Bee, Deputy Barney Fife, and the town of Mayberry. 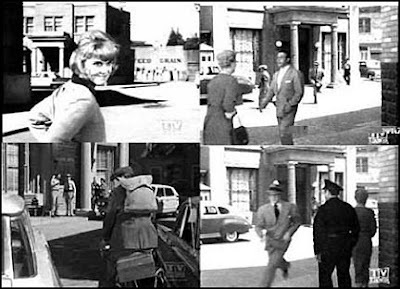 Eventually a movie will be made about Taylor and Mayberry, thus making the town and its residents a part of modern pop culture. April 1962--TWILIGHT ZONE--"Hocus-Pocus and Frisby"--More speculation from Toby O'Brien. "Mr. Frisby lived in Pitchville Flats, in an extremely rural area of North Carolina, but probably not too far from Mayberry and Mt. Pilot. 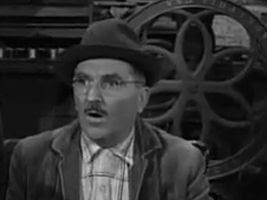 At least it was probably close enough for Floyd Lawson's father to visit another woman in that town, because Floyd had an identical twin named Mitchell (Mitchell Lawson?) who liked to hang around Frisby's general store and listen to Somerset Frisby spin his tall tales - even if he didn't believe them. (Toobworld bloodlines are strong, so it could be that Floyd and Mitchell don't have the same father, but instead can trace their ancestry back to the area's first Indian agent, Daniel Lawson.) 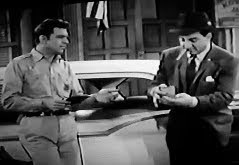 "
c. 1963 to 1964--THE JOEY BISHOP SHOW--Joey takes a vacation in a cabin located near Mayberry and encounters Deputy Barney Fife. 1964 to 1970--GOMER PYLE, U.S.M.C.--Gomer leaves his job as Mayberry, N.C. gas station attendant to serve a a six year term (likely a three year term initially then reenlisted for three more) in the Marines. November 1965--GOMER PYLE, U.S.M.C.--"A Visit From Cousin Goober"--Title is self-explanatory. 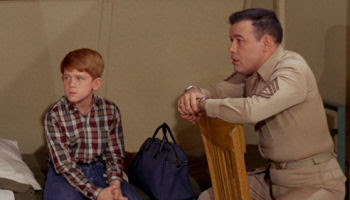 March 1966--GOMER PYLE, U.S.M.C.--"Opie Joins the Marines"--Well, not really, but the Taylors do come and visit Gomer. November 1966--THE LUCY SHOW--"Lucy Gets Caught Up In the Draft"--Due to a clerical error, Lucy Carmichael is drafted into the Marines. 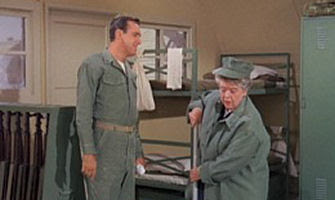 She finally gets out of it, and as she leaves, in enters Gomer Pyle. March 1967--GREEN ACRES--"The Saucer Season"--Mike Jones somehow ends up on Hooterville. September 1967--GOMER PYLE USMC--"A Visit From Aunt Bee"--Aunt Bee visits Gomer. 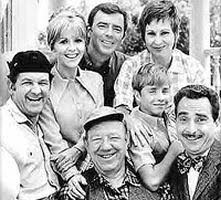 1968 to 1971--MAYBERRY R.F.D.--The story of farmer Sam Jones and the town of Mayberry. January 1971--THE NEW ANDY GRIFFITH SHOW--"My Friend, the Mayor"--Politician Andy Sawyer moves his family back to his hometown of Greenwood to become the next mayor. Mayberry residents Goober Pyle, Emmett Clark and Barney Fife make a guest appearance in the pilot. May 1978--GOOBER & THE TRUCKER'S PARADISE--Goober opens his own truck stop. June 1984--CANNONBALL RUN II--Gomer is tricked into helping a duo trying to win a cross country race. Another one of the competitors is Jackie Chan, who will later go on to many other adventures, and is the descendant of the Shanghai Kid. Note there is also an appearance of one of the Van Helsing family. April 1986--RETURN TO MAYBERRY--After having moved away, Andy Taylor comes home to visit. 1988 to 1990--IT'S GARY SHANDLING'S SHOW--One of Gary's neighbors is Howard Sprague, formerly of Mayberry. November 1993--ANIMANIACS--"Dough Dough Boys/Boot Camping/General Boo-Regard"--Wakko's hair is cut by Floyd, the barber. Fall 1994--BUFFY THE VAMPIRE SLAYER--"Faith, Hope & Trick--Mr. Trick states that Sunnydale's death rate makes D.C. look like Mayberry. April 1997--THE SINGLE GUY--"Vegas Finale"--Either Gomer appears, or someone acting as Gomer based on the character from the film made about Sheriff Taylor and Mayberry. November 2007--BOSTON LEGAL--One of the attorneys compares their current location to Mayberry. May 2013--WAREHOUSE 13--From Gordon Long: That bowling ball might have been in Mayberry. In one episode of the Andy Griffith show, Howard is one frame away from bowling a perfect game---the first ever in Mayberry---in what I think was a league match, and the lights go out, but not until Goober bets on Howard's perfect game, putting additional pressure on Howard. I can't remember what happened after they decided to postpone the finish of the game, though... It's not exactly a crossover, but I just realized that the Darling clan who lived near Mayberry must be related to the Duke family. Not only do the patriarchs of the two clans (Briscoe Darling Jr and Uncle Jesse Duke) look and sound alike (yeah, I know, same actor-as-cousin characters principle) but both families have musical abilities (the four Darling sons were played by a country musical group, the Dillards, and the Duke boys' actors John Schneider and Tom Wopat were country singers). 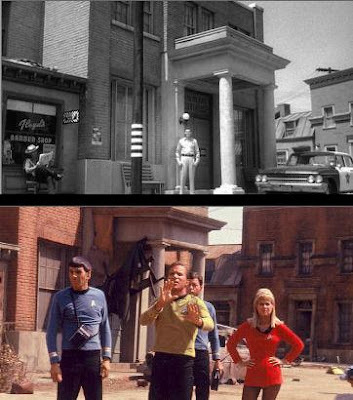 This shot is of particular interest, showing Captain Kirk and Edith Keeler walking past Floyd's Barber Shop. 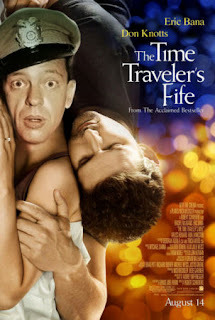 Now, this presents an interesting problem: "Forever"'s New York is clearly New York, but Mayberry is clearly Mayberry. It would be easy enough to say that Floyd started as a barber in 1930 NYC before moving to Mayberry mid-century, but that still leaves the problem of "Miri". One the one hand, it's far more likely that the Enterprise's crew would investigate an apparently abandoned Earth in a major city than a small town; but on the other, the above link notes how Miri's Town is laid out exactly like Mayberry. DIGIMON UNIVERSE--March 2000--DIGIMON: DIGITAL MONSTERS--Aunt Bee and Barney Fife appear in this animated film!!! 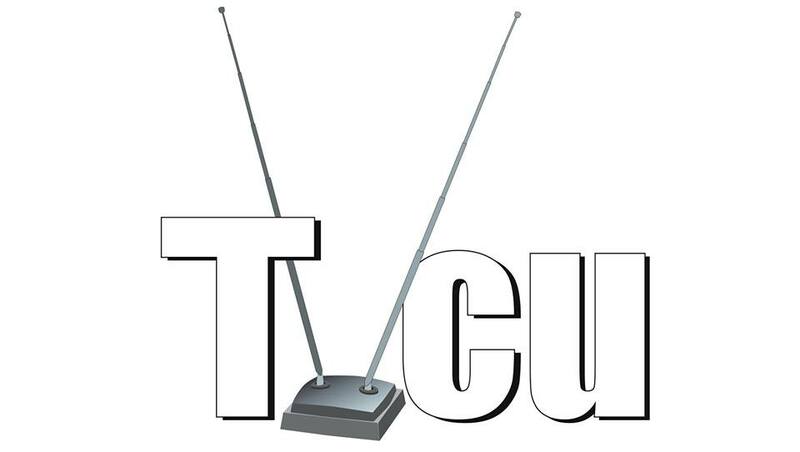 Are Aunt Bee and Barney Fife appearing on a TV screen or as actual characters in the story? Thanks. The AU information is very helpful.